Giraffes are the world’s tallest land mammal. Males (called bulls) grow up to 5,3 m and weight 1.200 kg on average. Females (called cows) are smaller, they grow up to 4,3 m and weight 830 kg on average. Giraffes have a steeply sloping back from the shoulders to the rump, and a long tail with a black tuft at the end to whisk away flies and other flying insects. Their legs are also long. They have a very long neck with a short and upstanding mane. It is made up of seven cervical vertebrae, as humans; but they are larger and bound together with ball-and-socket joints for improved flexibility. 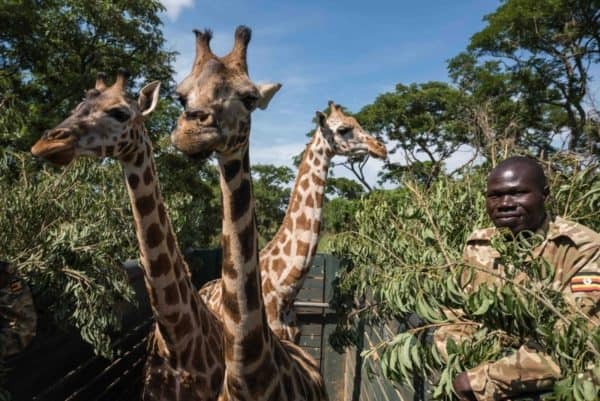 With the aid of its long neck, giraffes are able to exploit a band of foliage beyond the reach of all other terrestrial browsers, except for elephants. They present horn-like protuberances on their heads called ossicones. These are formed with ossified cartilage covered with skin and fur. Ossicones are thin and tufted in females, and thick and bald on top in males, as a result of wearing during fights with other males. Ossicones possibly take part in thermoregulation. Some males develop calcium deposits on top of their heads, which creates the illusion of the animal having more than two horns. The result is somewhat unsightly, but can be used to deliver heavier blows during fights with other males. Giraffes’ tongue is about 45 cm in length and highly prehensile (capable of grasping). The tongue, together with a narrow muzzle and a flexible upper lip, allows giraffes to successfully negotiate the bigger thorns of acacia tree and pull the leaves. The end of the tongue tends to be black to prevent sun burns, as it is out and exposed to the sun a significant portion of the time, and may be pink or purple near the top. Both male and female have a spotted coat. The subspecies (and now species) differ slightly in colouration and patterning. Giraffes’ patches are first and foremost for camouflage, but each patch also acts as a thermal window to release body heat. The skin pattern is similar to one of our fingerprints, it is a unique identifier for each animal and constant throughout the Giraffes’ life. It was previously thought that Giraffes had a really big heart, but recent research has revealed that there isn’t room for this. Instead, Giraffes have a relatively small heart and its power comes from a very strong beat as a result of the incredibly thick walls of the left ventricle. 10% of the sale price of this neckwarmer is donated to the NGO Giraffe Conservation Foundation. For further information about the work carried out by Giraffe Conservation Foundation, take a look to this page. Nine subspecies of Giraffes are currently recognized. 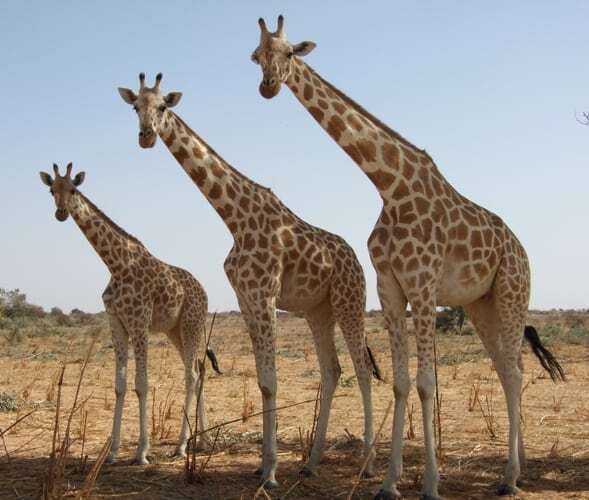 New findings propose that there are actually four species and five subspecies of Giraffe. However, more research is needed to confirm these new results and alter the up-to-date classification. Giraffes are widespread across Southern and Eastern Africa, with smaller isolated populations in West and Central Africa. They occur in 21 African countries and appears to have gone extinct in at least seven more (Burkina Faso, Eritrea, Guinea, Mali, Mauritania, Nigeria, and Senegal). Giraffes have adapted to a variety of habitats, ranging from desert landscapes to woodlands and savannas. Giraffes are polygamous. Meaning that dominant males usually mate with all the females in the herd who are fertile. They reach sexual maturity at three or four years of age, although males may not breed until the age of six or seven, due to the competition from larger males. Female giraffes go into oestrus every two weeks all the year round. Although giraffes do not have a mating season, breeding is more common during the rainy season because they are less stressed out and there is plenty of food to consume. To find which of them are willing to mate, the males smell their urine. If things look promising, male follows the female around until she stands still, indicating that the time is right. Finally, the male mounts the female from the rear and copulates with her. The gestation period lasts about 15 months. The interval between births is almost two years. Mother giraffes give birth standing up so calves are born falling to the ground from almost two meters height. Usually a single calf is born; twins are uncommon, but do occur. The new-born calves are able to walk within an hour or so. They depend on the mother’s milk for nine to twelve months and begin testing solid foods at about four months of age. During the first months after birth, calves are very vulnerable to being trapped by predators. Scientists report that only 1/4 of infants survive to adulthood due to the high rates of predation. After weaning, calves remain close to the female for almost two years. However, the independence period varies between bulls and cows. Cows tend to stay within the herd, and bulls tend to become independent. 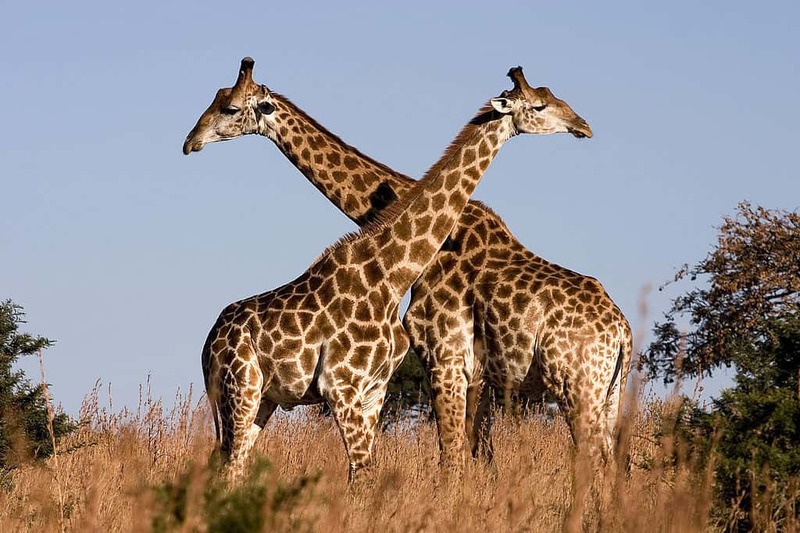 Giraffes communicate with one another by infrasonic sounds; so, beyond the range of human hearing. Their vision relies mainly on their height. It allows them to maintain herd cohesion in the vast savannah and to avoid surprise attacks from predators. Feeding takes up most of a giraffes’ day. Time spent browsing often increases during the dry season, as good quality food is harder to find, and they often have to travel further to satisfy their nutritional needs. Giraffes sleep only a few hours every day. They normally rest while standing up, although sometimes can be observed lying down. When lying down, giraffes fold their legs under their body, but mostly keeping their necks hold high. Occasionally, they can sleep with their head resting back on their rump. This form of sleep only lasts for very short periods of time because it is an extremely exposed position. Giraffes are herbivores and feed on leaves, stems, flowers, seed pods, fruits, and rarely grass. Their favourite food are acacia trees and shrubs. Males usually feed with their neck and head completely extended to reach branches higher than those the females are feeding from. They are ruminant, just like cattle or sheep. They swallow the food rapidly without chewing, so they are then forced to spend lots of time moving the food around between their four stomachs and their mouth. Giraffes regurgitate the food they have swallowed, then chew it, and finally re-swallow it. If there is water readily available, giraffes will drink often. They splay forelegs and/or bent knees to enable their long neck to reach down to the water. However, in arid environments, giraffes absorb the majority of their moisture thanks to the condensation that gather from the leaves. Lions are the main predators of giraffes. They are also vulnerable to leopards and hyenas, and to a lesser extent cheetah and crocodile. Most predators target young, sick, or elderly giraffes. Moreover, humans pose a big problem by poaching them. Giraffes defend themselves against predators by kicking with their long legs. They also run at speed of 50 km/h for sustained periods. The average lifespan in the wild: 25 years. Giraffes are non-territorial and social. They form flexible herds of 10 to 20 individuals in very variable ranges, depending on food and water availability. 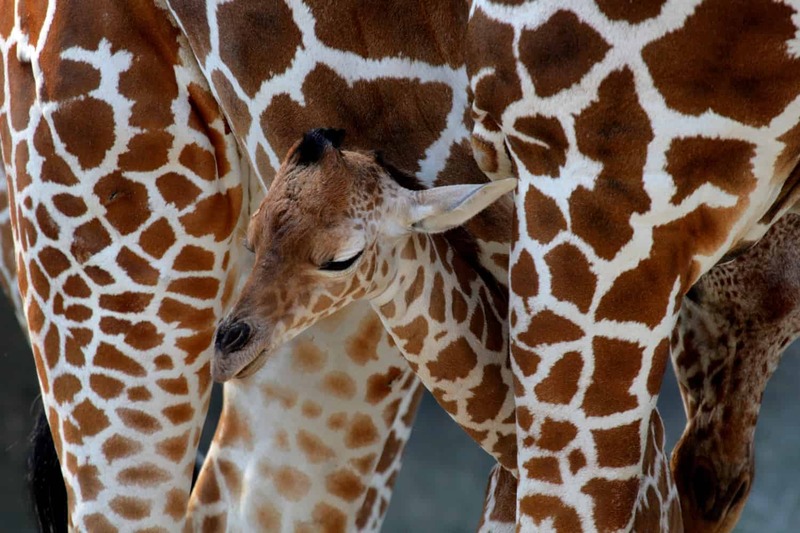 Giraffes do not have strong social ties, except the mothers with their offspring. Moms gather in nursery herds and look after each other’s calves while looking for food to protect their babies against predators. The young males that are old enough to care for themselves form bachelor herds. They will play and interact to try to find out who is the strongest and most dominant in the group. Mature males leave their born group and usually spend the rest of their lives alone, except for the mating season. Males do compete against each other for dominance and mating opportunities. They fight using their necks and heads as weapons. This ritual is referred to as “necking”. Giraffe populations have suffered a dramatic drop of 36-40% over the past 30 years and are considered as vulnerable to extinction. Habitat loss, degradation and fragmentation due to human population growth, which goes hand-in-hand with the expansion of agricultural and livestock activities. Also because of mining activities and uncontrolled logging. Illegal hunting for meat and hide. Drought conditions are becoming more and more common. This situation increases the risk of wildfires and human populations movements (sometimes into protected areas). Diseases such as anthrax and rinderpest. Car and train accidents outside protected areas. Most of these factors have not ceased and may not be reversible thorough the species’ range. 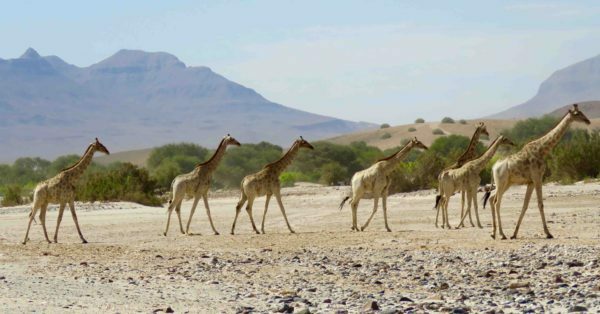 Given that giraffes are distributed throughout Africa and live from state-owned national parks and reserves to private and communal lands, conservation actions aren’t an easy task. However, these should include habitat management and protection by law enforcement, and community based conservation initiatives. Evaluated by the IUCN Red List of Threatened Species Vulnerable (2016). The Giraffe’s spot pattern is similar to one of our fingerprints. It’s a unique identifier for each animal. They can run as fast as 55 km/h over short distances and cruise comfortably at 15 km/h over longer distances. Oxpecker birds ride on giraffes and remove ticks and other parasites from their skin. There is a mutual beneficial relationship between giraffes and oxpecker birds. A Giraffe’s kick can be lethal. It can kill a lion! Giraffes and camels have a distinctive pacing gait in which they move both legs on one side of their body and then both legs on the other side. The umbilical cord breaks when the new-born drops to the ground. Giraffes have no front teeth in their upper jaw. Historically this species has been overlooked in terms of research and conservation, but a considerable progress has been made in recent years.